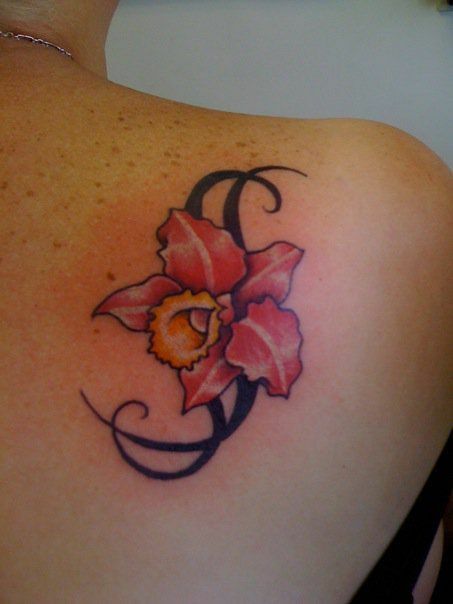 This flower tribal tattoo image is inked on the back of this girl’s right shoulder in black, pink and yellow colors. Shoulder tribal tattoos for women are common because they can be smaller than the large tribal tattoos men often get. This girl’s shoulder tattoo is relatively small and includes a pink flower with a yellow center and black tribal swirls behind the flower. Tribal tattoos with flowers are interesting because they mix the femininity associated with flowers and the power and strength that tribal tattoos typically symbolize. Although tribal tattoos are more popular among men, they can be just as attractive when inked on women, especially when they include feminine images like flowers. Tribal tattoos are one of the oldest types of tattoo designs that exist, and women can wear them just as well as men! Check out more Tribal Tattoos.